The latest productivity figures from the Office for National Statistics (ONS) show that the greatest increases in productivity since 2008 have been among micro-businesses. 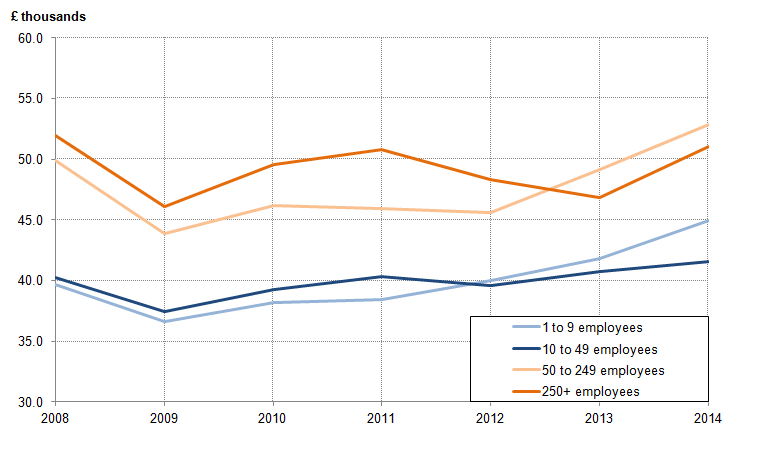 The ONS define micro-businesses as ones with between 1 and 9 employees. These businesses account for 19.83% of all UK business but if you also include businesses with no employees that goes up to 95.49%. Traditionally micro-businesses have had lower productivity than larger corporations. This is due to the economies of scale that larger businesses can achieve by investing on technology and separating tasks out to specialist departments. The numbers of micro-businesses, and especially single employee businesses, has grown dramatically since 2008. As self employed people on average earn less than employed people we would expect to see more self employed people equal less economic activity. While a direct relationship is hard to prove a number or reports have linked increased number of micro-businesses to weak productivity figures for the UK economy as a whole. The ONS figures still show that micro-businesses are less productive than larger organisations but this gap is now significantly narrower than it was in 2008. The productivity gap between the largest and smallest businesses has dropped from 13.7 thousand pounds per worker in 2008 to 6 thousand pounds per worker in 2015. During the same time period micro businesses with 9 or fewer employees have overtaken small businesses (those with up to 49 employees) in the productivity stakes. The ONS don’t really speculate on why the productivity of micro-businesses might have increased. The range of explanations they offer include “improving productivity among small firms, changes to working patterns and practices or as a consequence of some unproductive firms ceasing trading”. This is pretty broad but could potentially include the increasing use of cloud software and internet services by small businesses alongside shifts towards outsourcing in the wider economy which have created greater opportunities for self employed people and smaller businesses to gain well paid work. Regardless of the causes behind the increased productivity of micro-businesses these figures demonstrate that they are an increasingly important part of our economy. The Company Warehouse provide a range of packages for new startup business including company formations, digital marketing and accountancy support. View our business startup packages online or give our consultants a call on 0800 0828 727.